The movie begins with a slow boom down to a sleeping Casey Siemaszko, before the camera rolls 90 degrees as Siemaszko wakes up and turns toward his alarm clock. Cut to the alarm clock as the camera rotates. Richard Tyson’s legendary delinquent Buddy Revell gets not one, but two memorable introductions in Three O’Clock High. In the first (pictured below) the camera pulls back from the giant clock outside the school and then follows various students as they detail Revell’s rumored exploits – with each new group of students picking up the gossip where the last group left off. The long tracking shot ends inside the school as the camera pushes in to the student store where Siemaszko works. Now that Revell has been introduced verbally as a mythic figure, the next scene physically reveals him to the audience. 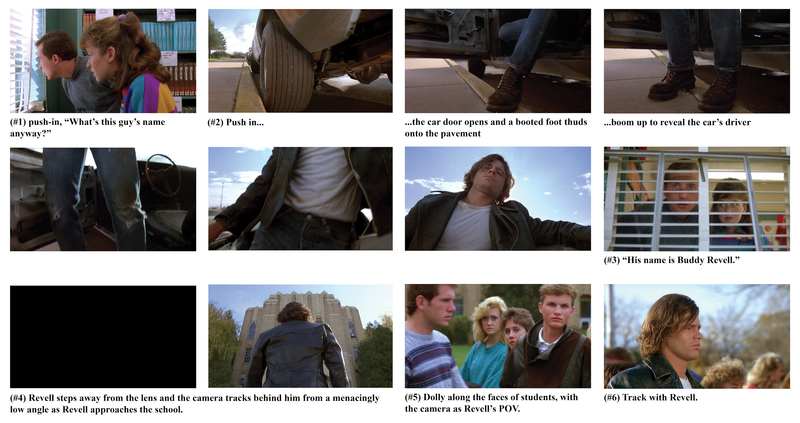 Below is a shot-by-shot breakdown of that intro.